(Bloomberg) -- Japanese Prime Minister Shinzo Abe and his deputy, Taro Aso, tried to close a perceived difference with the Bank of Japan over its 2 percent inflation target Wednesday, but ultimately left open a gap. Questioned by a lawmaker about his views on the target, Abe said in parliament that both he and Aso had faith in BOJ Governor Haruhiko Kuroda’s ability to achieve it. He said seeking the target had benefited the economy and there was no need to change it. Aso, sitting alongside him, said there was absolutely no discrepancy between his views, the prime minister’s and Kuroda’s toward the price goal. Yet he also said he had no intention of retracting the remarks he made last week. Those comments raised questions about whether Abe’s administration is no longer prioritizing the 2 percent inflation goal amid growing calls for the central bank to adopt a targeted range or lower the goal. Aso said last week it would be problematic if the BOJ focused too much on its 2 percent goal. Aso, who has repeatedly said reaching 2 percent inflation would be difficult, said that if inflation reached 1.99 percent nobody would complain that it hadn’t actually reached 2 percent. 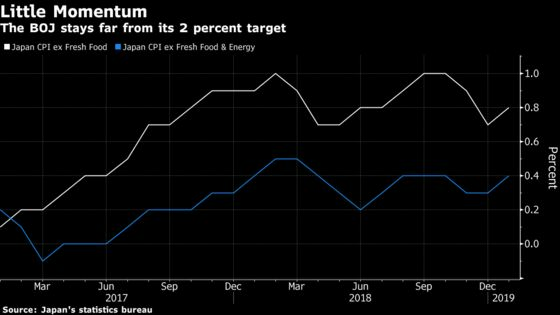 But that’s still at odds with the BOJ’s stated commitment to continue easing until inflation exceeds 2 percent and stays above the target in a stable manner.